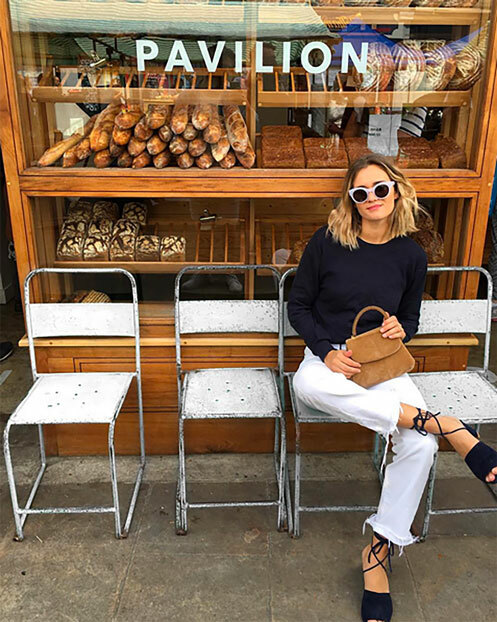 For those endeavoring to crack the secret of French style, look no further than to my new real girl style crush, Paris-based stylist and fashion editor Adenorah Mais. 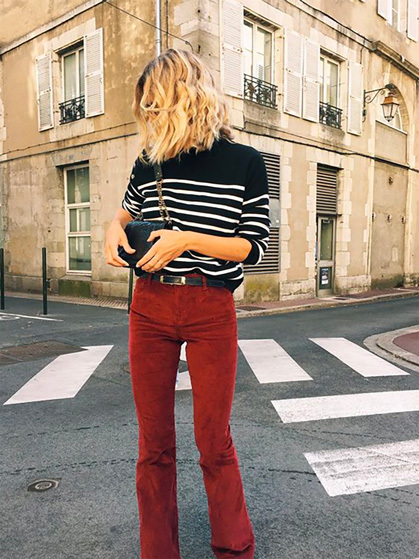 Her wardrobe brims with distinctly Gallic accents, such as simple, feminine blouses, perfectly-fitting high-waisted jeans, striped Breton tops, year-round basket bags, and lace-up espadrilles. Like the chicest French femmes, Adenorah's outfits are effortlessly simple, comprised of closet classics--i.e., jeans, comfortable tops. The je ne sais quois happens when she adds inimitably cool accessories like a vibrant shoe or a retro-spirited ladylike bag. Some of her style signatures I'd like to integrate into my fashion mileu include this sailor striped Maje sweater (pictured immediately below), these reconstructed Levi's jeans (or these from Current/Elliott), these white Le Specs sunglasses, this striped J.Crew tee, this pinstriped Veronica Beard dress, this white vintage-looking For Love and Lemons blouse (or this one), this cropped Marc Jacobs jacket, this Sensi Studio basket bag (or these Jane Birkin-inspired vintage ones here and here), and these lace-up Loeffler Randall flats.